May 10, 2017 May 5, 2017 / J.K.
For the most part the book is about the marriage of Katharina and Marin Luther. The first few chapters look at the two of them individually, then their life together, culminating in the death of Martin. The book is at its best, not necessarily discussion their marriage, but when getting into the minutia of life in the early modern period. The book is at it’s worst when the author seems surprised by the fact that life was hard for women 500 years ago. If you are looking for an interesting book about the marriage between a former monk and former nun, this is probably not it. There are interesting insights, but it is far from a good history, there is a good bit of editorializing and comparing them to marriages of today. There is a little bit about the famous Table Talks and their life together mentoring and growing the next generation of reformers, but not nearly enough. In my view, this should be the centerpiece of a book about their marriage. 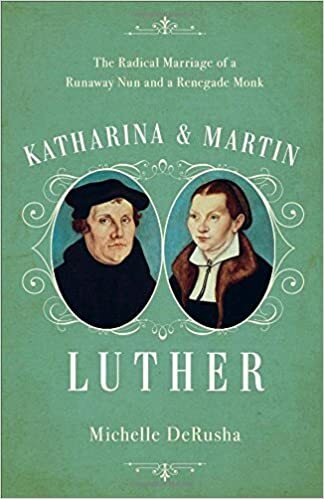 It truly was revolutionary, but the author instead focuses her surprise on the fact that Martin loved and respected Katharina despite believing the Bible to the the Work of God. It should be pretty clear from above that I was a little disappointed in this book. The author goes in and out of interesting historical facts to discussing her shock that someone could read the Bible, believe it, especially as it pertains to the so-called ‘roles of marriage’ and then still love their wife. She starts with a good history of the issues women face, and they are shocking and substantial, but she doesn’t seem to be able to separate them from their place in history and our current time. She anachronistically puts modern views into the history of the early modern period. Katharina and Martin hosted dignitaries, students, pastors, and leading intellectuals of the time from across Germany and other parts of Europe. She really misses out in this book by not getting into more of those conversations and how they related to each other. She also comes off a bit patronizing, unintentionally, to Katharina. She takes minor quips and solid comebacks and conflates them into great iconoclastic events. Overall the book seems a bit jumbled, shifting focus too often. There is far too many uses of phrases like, ‘one wonders’ and ‘it’s not hard to guess’ for my liking. To be fair, in her defense, she never claims to be a historian or that this book is a definitive biography of historical discussion on their marriage. Her near unending shock that there are many letters retained from possibly the most famous and impactful European in church history greatly outnumber his wife’s letters in a time when most women (or people for that matter) could not even read, gets old quickly. I guess if you happen across this book at a good price it could be worth while, but over all, it is probably not worth your time. *I received a free copy of this book in exchange for an honest review. See more here.